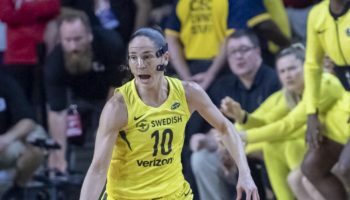 WHITE PLAINS, NY — After 412 days, the Indiana Fever finally achieved something it can look back fondly on in an otherwise disastrous season – a winning streak. 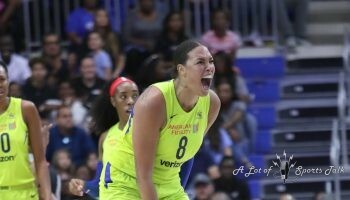 Candice Dupree led all scorers with 25 points while she and her teammates put on a historic defensive performance in the fourth quarter in a come-from-behind 68-55 away victory over the New York Liberty, marking the first time the 2018 Fever, now just 5-23 on the season, have won consecutive games after their victory over the Dallas Wings on Thursday. Indiana, once down 15 in the first half, was able to cut that deficit to two at 53-51 at the end of the third quarter before putting the clamps down on defense in the final 10 minutes, holding the Liberty without a field goal in the entire fourth quarter while outscoring New York 17-2. 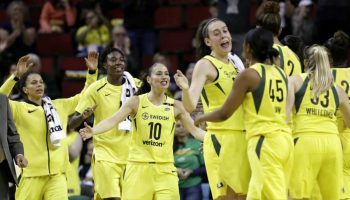 It marked just the eighth time in WNBA history that a team failed to make a field goal in a quarter and New York’s two points in the quarter ties for the second-fewest points in a quarter in regulation in league history. 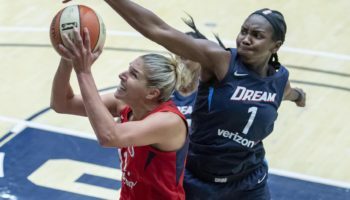 A historic defensive performance, let alone a victory, was hard to envision for the Fever early on as the Liberty jumped to a quick 5-0 lead, forcing Indiana to call an early timeout with just three minutes of action. That lead expanded to 19-4 after Marissa Coleman knocked down a three-pointer with a 1:51 remaining, and the Liberty ended the quarter with a 21-7 advantage. 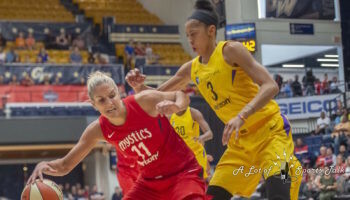 Less than 48 hours after its win in Indiana against Dallas, it looked as if the Fever had heavy legs as it traveled to the Empire State and played an early game on Saturday. The Fever, led by Dupree, went on a 20-7 scoring run to cut the 15-point deficit to 29-26 with just under two minutes until halftime. New York was able to extend their lead to 35-31 at intermission off a lay-up from Rookie guard Kia Nurse. Liberty forward Tina Charles hit her first two shots of the second half to increase New York’s lead to 39-31. Once again, the Fever responded, this time with an 11-4 run to cut their deficit to one at 43-42, the closest Indiana had come to gaining its first lead of the game. Nurse and fellow Liberty guard Bria Hartley hit back-to-back jumpers to build New York’s lead back to six before Indiana guard Tiffany Mitchell and fellow reserve guard Kelsey Mitchell made jumpers to close out the quarter with Indiana only trailing by two, 53-51. The Liberty only had one player in double figures in scoring, as Charles finished with 11 points as New York was officially eliminated from playoff contention. Indiana has six games left in the season to make up for what probably will go down as the toughest season in franchise history. “The mentality is just coming out and fighting hard and try to get wins even though we are eliminated from the playoffs. We can’t give up. The plan is to still learn and just get ready for next season,” Dupree said.